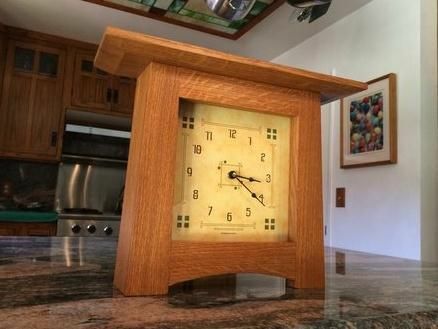 Arts & crafts style wall clock made from quarter sawn white oak. That is a classic design, looks great with nice colors and QSWO grains! This clock is so beautiful. You did a wonderful job on it. what finish did you use to show off the QSWO? Luv2wheels. Thank you so much. I used artest oil paint colors, raw umber, burnt umber, burnt sienna and raw sienna, mixed w/terpintine. I find the the terpintine allows the pigment to penitrate the wood better than paint thinner. If you want a lighter color use paint thinner or mineral spirits instead of turpentine. I used more rew sienna in the mix to keep it on the yellow side. This stain must dry for at least 5 days depending on heat and humidity.. You can smell when it’s dry. The clear coat is 3 coats of min wax poly wipe. I like to let it dry over night between coats, sand w/250 grit or more. Last coat is sanded with a brown paper bag after it drys. You can also add a coat of Johnson paste wax after it drys. I like to start my next project drawing while all the above is drying. Experiment on a scrap of leftover wood untill you get the the color you want. Aj1104. Thanks for the kind words. Order the time ring size you need.. I ordered the 5”. That’s 5” from the top of the 12 to the bottom of the 6. My opening on the clock is 7”. So the thin board I spray glued it to was 7”x7” the face comes on a larger photo paper that has to be cut away before gluing to you board. Make sure you face is square to your glue board. James , nice job and congratulations on your ‘Daily Top 3’ award. That’s a very nice looking A&C clock—I love that clock face!